Fill out donation form on Home page. The hatchery is entirely run by volunteers and relies on donations from individuals and interested groups to operate. Many individuals and local groups businesses support the hatchery both financially and with practical assistance. The work is completed by volunteers and a core group of around 20 are involved, however upwards of 50 persons can respond to calls of working bees at the hatchery. The Salmon & Riparian Support Trust. This was formed to assist the hatchery and other riparian work by raising the necessary funds for the various projects identified by the management group. Nowdays this is an incorporated society. Individuals, groups, and companies wishing to make donations to the hatchery need to make cheques out to the "Riparian Support Trust". Fonterra Clandeboye has assisted with working bees and assisted with grants to riparian planting and the incubation shed at the hatchery. South Canterbury Salmon Anglers Association make an annual grant to the hatchery and many of it's members are active workers of the hatchery. RGB Group at the Rangitata mouth, run a very successful raffle every year and donate the proceeds to the hatchery. Both communities at the river mouth (North and South Hutholder associations) assist with man power and financial grants on occasions. Many individuals make grants and donations to the hatchery operation and assist with the day-to-day running. 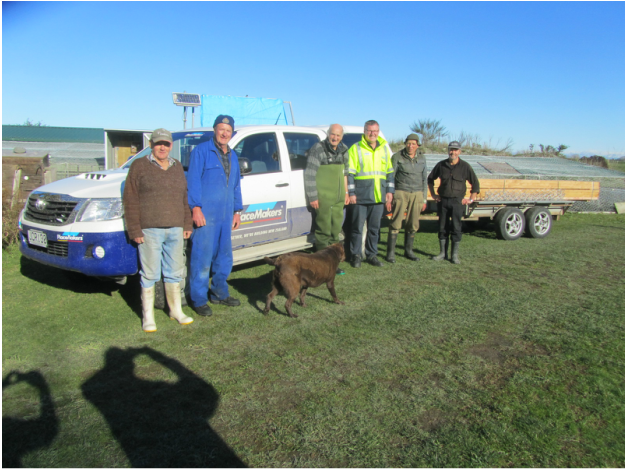 We are extremely fortunate to have an association with Placemakers Timaru Ltd. Photo shows hatchery helpers along with new Joint Venture Partner manager Brendon Leary, with timber he sponsored for headrace repairs etc. 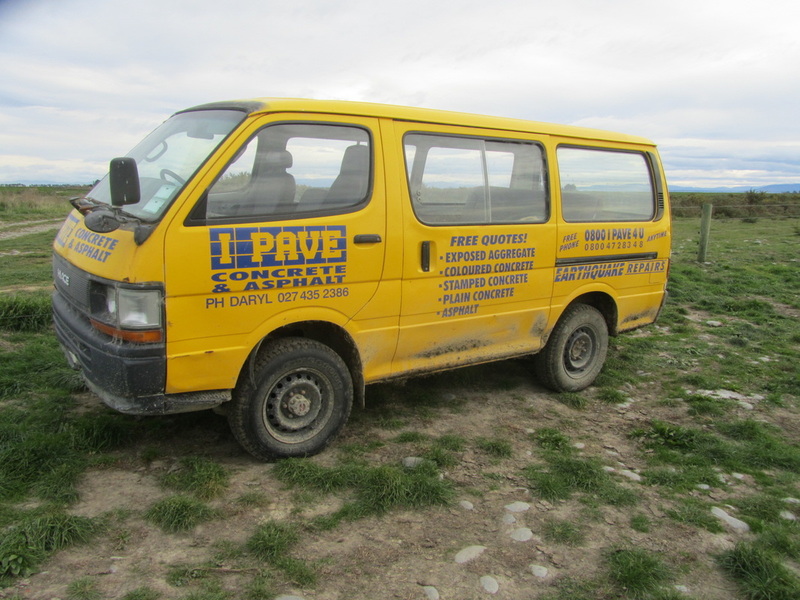 Good old Hatchery van, saves our cars from continuous washing, donated by I Pave Ltd.
Once again the Rangitata Good Bastards group at the Rangitata South camp, donated the proceeds of their successful raffle to the Hatchery. The funds were put to the building of a new SS tank for the hatchery incubation shed. The following sponsors made this raffle another roaring success : The CompleteAngler, Hunting @fishing Columbo st, Tegel Chicken, Hamils Washdyke, The Chequered flag, East Side butchery, Repco Wairakei rd ch ch, Sports serviices ch ch, Anchelle Auto trim Temuka, Phil Hart, Rangitata South motor camp, Jeff dermott painters ch.ch, Glenn shaw Gld. Please Support these guys when you can. Donations to the Salmon & Riparian Support Trust have also recently come from the "Thomas Hobson Trust", the Mid and South Canterbury Community Trust", and the Timaru District Council. These donations have assisted with the upgrade of the solar power system, the purchase of Gabion Baskets for stream restoration and assisted with SS tank and new screens. To the many other sponsors and supporters, thank you from the Hatchery Trustees.